What if God got a C- in Universe Building 101? This one sentence blurb captured my imagination and I had to buy this book. Steve LeBel has created a unique world were Gods work for the Company building universe for reasons. The reasons don’t matter, what matters is the fascinating why they build their worlds as they try and create new and interesting realities. Enter Bernie. He’s wasn’t the best student in school. He has some difficulty with ethics (he foolishly believes higher life forms shouldn’t be snuffed out at the whim of their creators). But he is the son of the famed builder, so Ezrah (head of HR), with the urging of his secretary Suzie, decides to gamble on hiring young Bernie, assigning him to Shemal’s department. Only there’s one problem. Bernie’s childhood rival and bully, Billy, is Shemal’s nephew, and Billy is looking to get payback on Bernie. As Bernie tries to build his first universe and pass his probation period, Billy begins to sabotage him to get Bernie fired. With the help of his friends Suzy and Lenny, Bernie fights back against Billy’s attacks on his Universe. But unbeknownst to Billy, higher life had formed on his Universe and the inhabitants, led by Alcandor struggle to understand the cataclysm befalling their world. Steve has created an absolutely interesting world. The Gods exist in a world not unlike ours. They go to school, they have jobs, they get married and have kids. But they also create universes and its fascinating reading about Bernie and Billy’s war as Bernie has to fix every problem Billy causes. And while there war is going on, he explores how primitive people attempt to explain the events beyond their understanding as Alcandor’s people are afflicted by Billy’s attacks. The characters are great, and Bernie and Suzy have a cute relationship that grows so slowly as the dense Bernie finally realizes Suzy is more than just his friend. 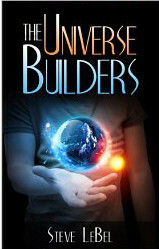 You will not be disappointed by The Universe Builder. You can buy it for $4.99 on Amazon. Thank you so very much for the wonderful review! I really appreciate your kind words. I saw that you are also working on your own writing. Good luck!